For the 11th year in a row, the Institute for Rural Health (IRH) at WKU received an $8,000 grant through a partnership with the Allen County Health Department to continue dental services in Allen County. The IRH utilizes the funds to purchase materials, supplies, and equipment for use in the Dental Sealant Program at Allen County Primary Center and James Bazzell Middle School. 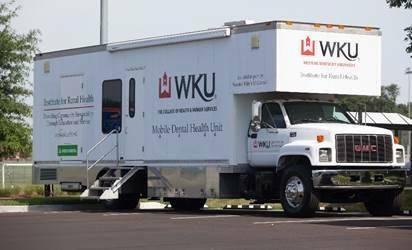 Since 2004, the IRH Mobile Dental Unit staff and students in the WKU Dental Hygiene Program have provided dental exams and services to more than 2,700 children in Allen County. Learn more about the Institute for Rural Health’s outreach by visiting their website: http://www.wku.edu/irh/.